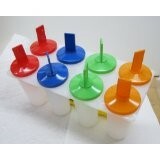 Plastic Popsicle Mold with no drip spill guard, makes 8 individual frozen pops, easy removal of 1 pop at a time or all 8 pops, with sticks, each pop is 3 ounce, 3.25" high, easy to use, easy to clean, dishwasher safe, multi-colored and reusable. An easy way to make cool refreshing treats for the kids and everyone else, great for use with juices, soft drinks, chocolate milk, drink powders, and much more. Use instructions included. Made in USA.